Description: Twice folded A4. In the cover the texts: Kiskot vievät kisoihin. ISÄNNYYS VELVOITTAA YSTÄVÄLLISYYS VALLOITTAA. Rautatieasemat Helsingissä olympiakisojen aikana. In the inside spread the heading: OLYMPIAMIELI – OLYMPIARYHTI. 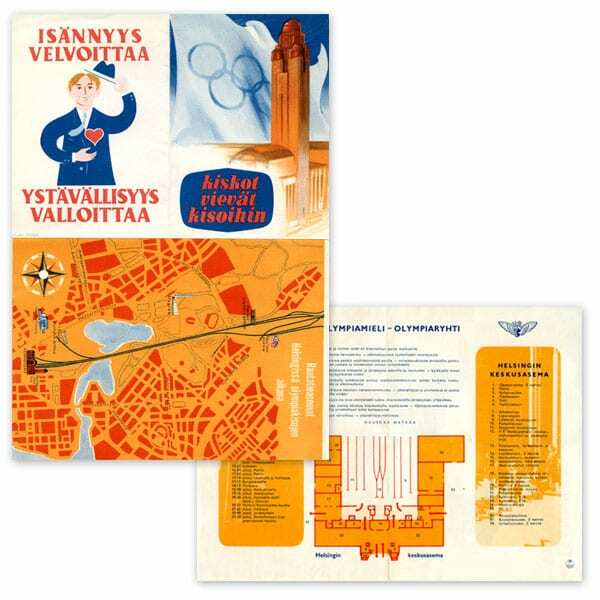 Other information: Contains the map of Helsinki railway stations and instructions of good behaviour for passengers to the Olympic Games.